You are here: Home › News › How to choose storage media in Cubieboard? We have many considerations when choose the storage media in the computer system or some other electronic equipments. As we known, storage system is really very important and essential in computer architecture. And as the open source hardware, we must consider more than traditional computer because we have to face a broader application scale. You know we use Allwinner’s main chip A10 and A20 since its lower price, high performance, rich interfaces and his kind open-source attitude. But we also found their good chip design in storage media support. So when we were designing, we tried our best to support these good features. 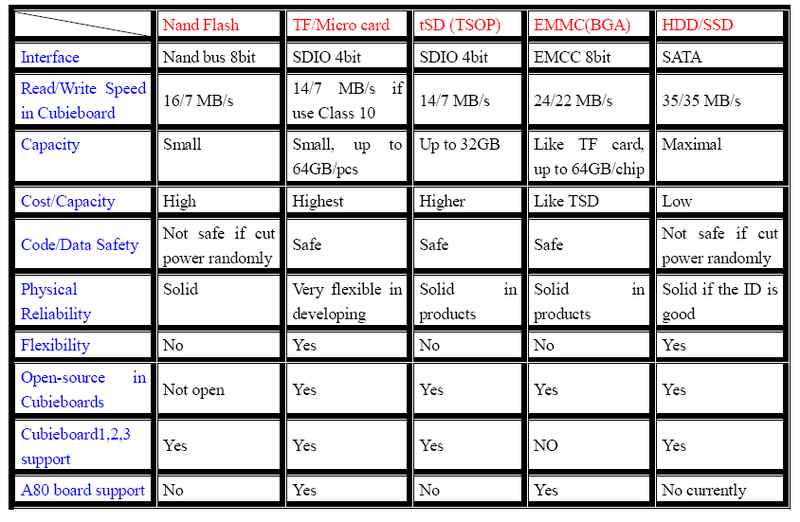 Cubieboard1, Cubieboard2 and Cubieboard3 can support NAND FLASH, TF card, TSD and HDD, but they don’t support EMMC. EMMC is 8-lines chip with EMMC interface. It’s useless when used in A10&A20 because A10&A20 don’t support 8-lines EMMC interface. Fortunately, A80 can support 8-lines EMMC interface. So in the upcoming A80 platform, we will adopt EMMC solution to get faster read/write speed. Another issue everyone concerned is SATA port. In my opinion, SATA is not very important at this time if EMMC is supported. A80 board has up to 64GB storage capacity with just one piece of on-board EMMC chip and the speed is also not very low against SATA port. Even more, the USB3.0 port is also a very good way to extend the storage capacity with fast access speed. In the above table, I set out 5 sort of storage media which are very common used for your easy comparison. I think you will make a different choice if the position is different. Here I would like to give you some advices. If you are a developer or playing Cubieboard for fun, Cubieboard dual-card version is very suitable. You can try lots of card based operating system from the community at your pleasure. But you should buy the TF card with Class 10 specification. Higher read/write speed will bring you more smooth using experiences and shorter start-up time. I once met the start-up time from 30s~90s with different TF card. If you plan to apply Cubieboards in your product, you should consider this problem carefully. If the products have no backup power supply and will probable be cut power off randomly, you should not choose NAND Flash and HDD. The code/data may be damaged when power cutting off if a batch data writing has not finished. TSD and TF card can solve this great hidden danger. TSD is a kind of chip with TSSOP48 looks like NAND Flash. But actually it is a TF card which contains Nand Flash and card controller. The controller has good firmware backup mechanism. In some other areas with backup battery, you can choose Nand Flash for its low cost. Nand Flash is widely used in lots of electronics devices. You can also guarantee the code safety at the level of software if it’s possible. 14 Responses to "How to choose storage media in Cubieboard?" I just registered here, to tell that SATA is critical: No SATA, no buy! An ARM-powered Board just like the Cubietruck(3) or 8, with 2 SATA-ports, even for 350€ (approx. 400$) would be an instant-buy! Well, I can’t wait to buy such an A80 board as shown in Youtube clips, but here in West Europe, I think the SD interface is becoming old fasioned very fast. So I would replace this with a microSD interface. I cannot imagine that the difference in cost of the board would be ten’s of USD’s. 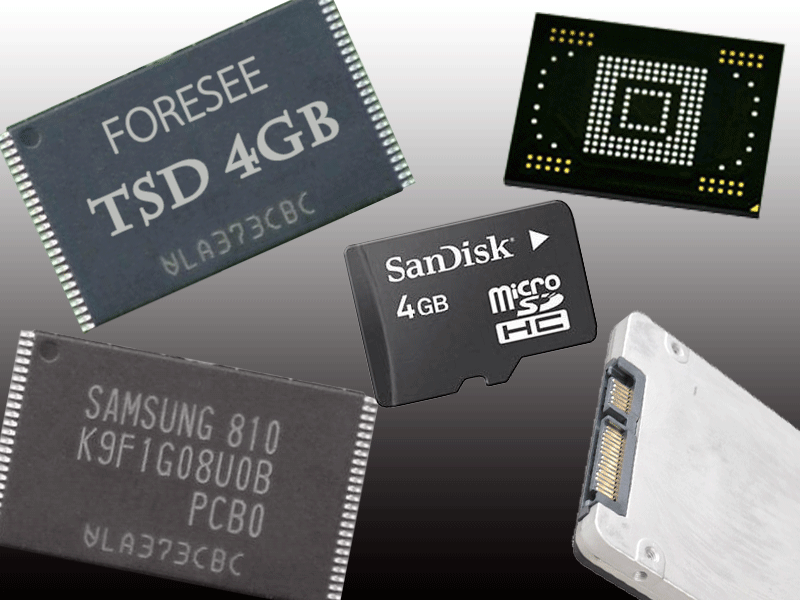 People will use the MicroSD with their phones and hardly have new SD cards. I agree also that a SATA interface is nice, but there are USB to SATA solutions. Buyers in Western countries will prefer most of the time a SATA drive. I would sure put an eMMC interface on the board, so people could stick a 64GB eMMC module on it and in the future perhaps an 256GB module. The Wifi standards are developing so fast, that I would not stick this on the board, I would link this with a small adapter in an USB port. I also think that not everyone will connect a Cubieboard to a Wifi interface. At home I prefer a normal network cable above the people snooping Wifi channels. I think in countries where the public support for fast Wifi is low, people could stick a Wifi G or N connector in the USB port, but in Western Europe people would prefer the fastest AC standard. My personal preference for support of a new revision of the A80 Cubieboard 8 would be support for SATA and replacement of the SD interface by a MicroSD interface and a connector like the Odroids have from Hardkernel for the eMMC chips. Wifi only supported through an USB connector. I doubt if it is possible, but I would also like a replaceble GPU so people could upgrade this easy. Cubieboard is the fastest in most things, but in some things it will be outrun by a Jetson Tegra K1 because of the GPU. I still will love the A80 Cubieboard 8 and I would prefer it above the Jetson Tegra K1 because of the different Operating Systems running on it. As a normal business user I would prefer Windows RT for some desktop apps and for personal usage a fast Linux Distro. Oh, it’s a pity that you discard the sata port everyone is so concerned about so fast. 64GB is nothing compared with TBs that you can get in a sata port. I choose the cubietruck because the things I were looking for were: sata, +1GB ram, >=100mb/s Ethernet in this order of preference. I do not count the usb port as a valid storage port because it has a lot of drawbacks, you can’t pass sata commands directly, so forget about monitoring with smartmontools, and forget about smart power saving, and usb is also much more unreliable than sata. I just hope that the “no currently” in the A80 sata column evolves to a “yes” in the future. I registered just to second this, SATA is vital for my usage and if anything I’d love to have multiple ports. If adding USB2.0 (Cubieboard 1/2/3) and USB3.0 (A80) to the chart, what would the read and write speed be in cubieboard, with a good quality USB memory stick attached?